9 times out of 10, the answer is the same: You want to get more clients or customers. But I also find that many people have some misconceptions about exactly how they are going to get their website to bring them more clients. 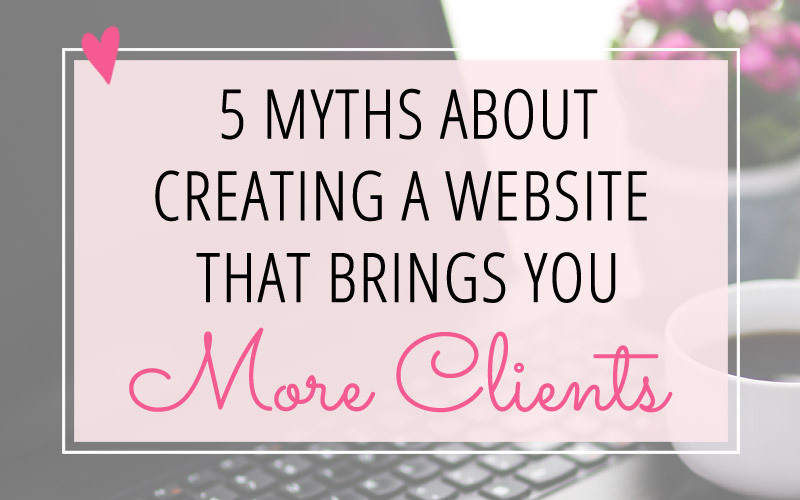 So today I’m going to fill you in on 5 myths about creating a website that brings you more clients. And don’t worry… I won’t leave you hanging; I will also explain what you can do to have a website that brings you more traffic, more newsletter subscribers, and yes – more clients. Myth #1: Your web design doesn’t really matter that much. Just pick a web design template and you’re good to go. Do the web design elements and colors match your logo and branding? What features and functionality is included? Where does the design guide your website visitors to go… and does that match with your plan for getting new clients? Does the design let people find what they need – quickly and easily? Does the layout match the content you plan to have on your website? Now of course you can take a template and modify any of the above items to match your needs. (And I have done this for several clients!) But the more your template matches your branding, your content and your website goals, the easier and faster (and cheaper!) it will be to customize the template. Sometimes it’s more cost-effective — and more effective for your business goals! — to just have your website custom-designed right from the beginning. Choosing your design before you have created a plan can really hold you back from having a website that is streamlined specifically for your goals, including bringing you new clients. Do your planning first – so you know exactly what you need on your website. Then you can start looking at designs. To help get you started with this, I have recommendations for choosing a WordPress theme plus a free WordPress theme checklist. Myth #2: If you have a beautiful website, you’ll get new clients. If people aren’t finding your website through their Google search, you are missing out on new visitors who aren’t familiar with you yet. If your website takes forever to load – people aren’t going to stick around waiting. If your content doesn’t “speak” to them or isn’t helpful to them, you aren’t going to keep their attention long enough for them to want to stay connected with you – either through signing up for your newsletter, downloading a freebie, or signing up to work with you. Design is more than colors, fonts and images. It’s the overall experience people have on your website and the impression you make. When someone visits your website, they make an important decision: whether to stay (and hopefully take action) – or leave. If people can’t get what they came to your site for (to get helpful information, to contact you, to signup for your offer, etc. ), they’re not very likely to come back… no matter how beautiful your website is. 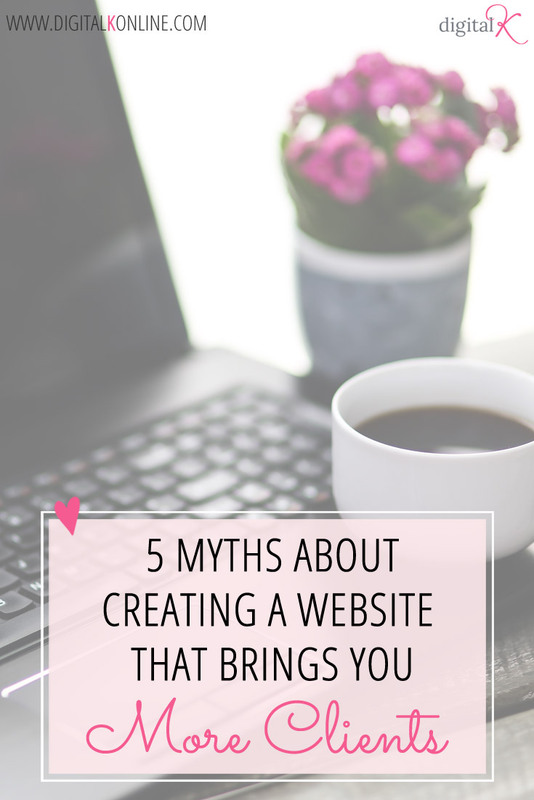 Myth #3: You can create an amazing website for your business in one weekend. Notice I didn’t say, “You can create a website in one weekend.” Can you create a website in a weekend? Sure! You could even create one in a day! But will it be effective for your business? Doubtful. There’s a lot of “behind the scenes” work that goes into making a great website that is user-friendly and showcases you and your services in the best way. Content needs to be well-written and helpful – and needs to speak specifically to your ideal clients. The website needs to be developed in a way that delivers the best experience possible to your website visitors. And your website should be optimized for Google and other search engines so you show up in search results. It takes a lot of time to both plan and create a website that converts visitors into clients. Myth #4: You need to include a “Contact” menu link so potential clients can work with you. This isn’t enough. Not even close. Website visitors are in different stages of their relationship with you. Some are first-timers that are just starting to check out your website. They may be just reading a blog post – or they might be interested in downloading a free resource you have available on your website. Others may already be familiar with you and want to stay connected through your newsletter. Or maybe they have a question they want to ask you. And still others may be ready to sign up for your services. Your website needs to meet each of these different needs. In addition to having a contact form, you’ll also want to let them contact you by requesting a resource, signing up for your newsletter, or signing up to work with you. All of these actions need to be accounted for on your website, with prominent and easy-to-find calls-to-action that encourage them to take the next step. Myth #5: If you have a great website, new visitors to your website will sign up to work with you right away. Sorry – but this isn’t likely. You need to build trust first. Most people need to feel comfortable with you before they’ll signup to work with you. It may seem a little overwhelming when you start to think about all the factors that come into play when you’re creating a website that brings you more clients. That’s why I created a website package that helps you with this entire process: Envy This! Website Package. That Helps you Stand Out Online! 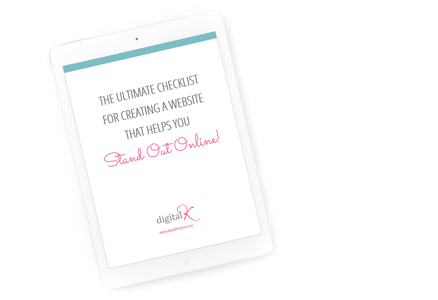 Get this 4-page checklist for your website strategy, tech, design, development and more. Also includes my recommendations for plugins and website services too!